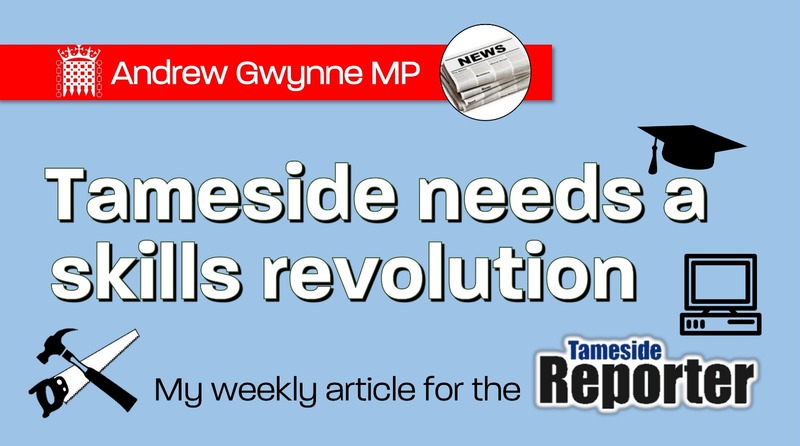 The UK is suffering from a skills deficit in the workforce, which is having a real impact on the jobs and future career prospects of young people across Tameside. If you talk to small and medium sized business owners or entrepreneurs locally, they’ll often admit that they struggle to hire the right staff to certain posts because of the lack of workers, particularly younger workers, with the adequate skill set and training. Sadly the skills deficit is nothing new and has arguably been one of the key drivers behind the UK’s sluggish economic growth this past decade, as well as one of the lowest productivity ratings among developed nations. The Engineering Federation (EEF) has kept a close eye on the needs of the firms it represents over the years. It reports that when looking at the proportion of vacancies in the sector that it deems ‘hard-to-fill’ the figure stands at an eye watering 29%. This has barely shifted since 2013, when it stood at 30%; this means that apprentice posts and future-proofed careers are going unfilled. The biggest driver behind this skills gap is the disparity between educational opportunities and training places across different regions of the country. A study of the number of degree-holders in every constituency in Britain reveals that in more deprived areas the proportion of the working-age population with a degree is falling while in the richest it has risen dramatically in recent years. For my Denton and Reddish constituency the problems caused by close to a decade of imposed austerity from this Tory government means that today 12% of the workforce have no qualifications and only 20% have a degree or NVQ equivalent. If we were to compare this to the Chancellor’s seat of Runnymede and Weybridge in Surrey for example, the differences are startling. The findings show that the Chancellor’s constituency contains 44% of people with a degree or NVQ equivalent, and crucially only 7% of people with no qualifications at all. Like with so many areas of life, education holds the key to improving social mobility, tackling poverty and extending opportunity for all. Those with the greatest access to qualifications tend to be healthier, wealthier and more active citizens. Clearly then, this report shows that the current divide between the haves and have-nots is growing, with your postcode largely determining your chances at educational success. Locally, Labour councils are doing all they can to negate the impacts of higher education and training cuts through local programmes aimed at supporting local businesses to grow and expand. Tameside Labour have invested millions into the Tameside Works First; a partnership between local businesses and the council where small and medium size enterprises can apply to join a list of other local companies that can apply for projects across the borough. This in turn helps them grow and facilitates their growth and ability to hire. This initiative is now entering its tenth year of success with the partnership between local business and the community growing, but we need much more support from Whitehall before Tameside meets its full potential. The UK economy is in stasis. While we’re not technically in recession, neither are we growing at the robust rates we used to enjoy either. It’s time we invest in our communities, for a better tomorrow.